The highest percentage of the suppliers interviewed in Hong Kong (42%) reported that domestic B2B customers pay invoices late due to liquidity issues. Hong Kong’s economy is forecast to grow 2% by the end of this year. The modest growth reflects, among others, China’s slowdown and the country’s vulnerability to the difficult external environment at global level. As trade-related activities in Hong Kong appear to slow down, suppliers surveyed in the country are confronted with a challenging business environment which prompts them to protect their businesses against the risk of payment default by B2B customers trading on credit. Suppliers surveyed in Hong Kong appear to be just as likely to sell on cash basis as they are on credit terms to their B2B customers. On average, 50% of the total value of their sales to B2B customers was transacted on credit terms. This is above the regional average (46%). It is similar to other highly trade-oriented countries in Asia Pacific, like Australia, Japan and Singapore, which show a notably strong propensity to trade on credit terms with B2B customers. 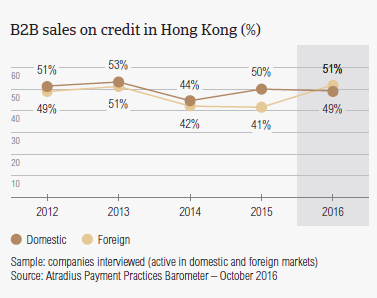 More specifically, 97% of suppliers interviewed in Hong Kong reported having offered credit terms to their B2B customers over the past year. In contrast to the regional pattern, which points to Asia Pacific suppliers’ stronger preference for trading on credit in their home market than abroad, suppliers in Hong Kong appear to be slightly more inclined to offer credit terms overseas than domestically. 48.8% of domestic, and 51.4% of foreign B2B sales were made on credit (averages for Asia Pacific: 50.3% domestic and 42% foreign). This is likely to reflect the open and strongly trade-oriented nature of Hong Kong’s economy, which now appears to be experiencing a notable deceleration in growth (from 2.4% in 2015 to a maximum of 2% this year) chiefly due to the adverse impact of China’s slowdown. 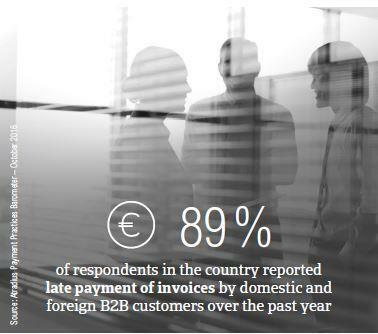 89% of respondents in the country (consistent with the response rate at regional level) reported late payment of invoices by domestic and foreign B2B customers over the past year. This resulted in an average of around half of the total value of B2B receivables remaining unpaid past the due date. This is above the average for Asia Pacific (44%). Late payment by domestic customers was reported to occur more often than from customers abroad. This is similar to what was observed in Singapore, Indonesia and India. Compared to last year, the domestic default rate in Hong Kong remained stable, and the foreign one decreased by an average of 3%. The steadiness of the domestic default rate is consistent with the challenging business environment in which the suppliers interviewed in Hong Kong currently operate. Late payment of (domestic and foreign) B2B invoices in Hong Kong is reflected in the Days Sales Outstanding (DSO) figure resulting from survey responses. This averages 35 days (survey average: 41 days), is the second lowest after that of Australia, and is two days shorter than one year ago. This is likely to reflect higher efficiency in collecting long outstanding invoices of high value. 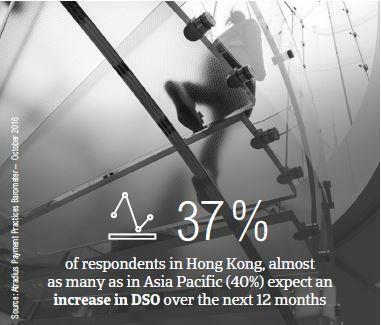 Almost as many respondents in Hong Kong (37%) as in Asia Pacific (40%) expect an increase in DSO over the next 12 months. 47% of the respondents in the country (45% in Asia Pacific) do not anticipate changes in the DSO figure over the same time frame. Suppliers interviewed in Hong Kong will be confronted with diverse challenges to business profitability this year and therefore, they will need to better protect their businesses to ensure profitability. Cost containment worries more respondents in Hong Kong (23%) than in other Asia Pacific countries surveyed (21%). This is also the case for collection of outstanding invoices (around 10% of respondents in Hong Kong versus 7% in Asia Pacific). Payment terms extended to domestic B2B customers by respondents in Hong Kong average 29 days from the invoice date (average for Asia Pacific: 32 days). Foreign customers are requested to settle invoices a little later than domestic customers (on average, five days later). These more relaxed payment timings may be seen as a way for suppliers in Hong Kong to strategically expand sales with overseas markets, now that sluggish global demand weighs on trading activities in Asia. Over the past year, the average domestic payment terms in Hong Kong have been shortened by an average of five days. This may be a mechanism used by suppliers in the country to cope with the challenging business environment. Payment terms offered to foreign customers, in contrast, are longer than last year (by an average of three days). 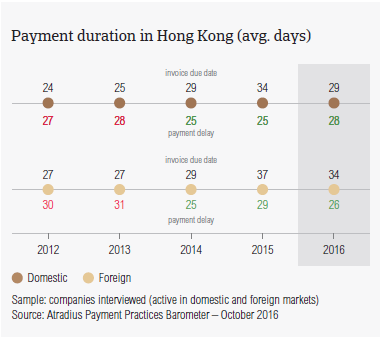 Despite longer payment terms extended in foreign B2B trade, both foreign and domestic customers of suppliers in Hong Kong settle past due payments almost at the same time, within an average of 27 days after the invoice due date (no change compared to last year). This means that suppliers interviewed in Hong Kong turn past due invoices into cash, on average, nearly two months from invoicing (in line with the average for Asia Pacific). In line with the response rate at regional level, the highest percentage of the suppliers interviewed in Hong Kong (42%) reported that domestic B2B customers pay invoices late due to liquidity issues. This has increased compared to one year ago (39% of respondents), suggesting a moderate deterioration of the trade credit risk environment in the country. Late payment of domestic invoices in Hong Kong, however, seems to be most often due to reasons that are unrelated to the customers’ creditworthiness . This is the case of the complexity of the payment procedure, which was cited by more respondents in Hong Kong (32%, up from 28% last year) than in Asia Pacific (27%). It is worth noting, however, that 25% of suppliers surveyed in Hong Kong reported that domestic B2B customers pay invoices late most often due to disputed invoices. Based on survey responses in the country, the complexity of the payment procedure appears to be the most frequent issue affecting credit based transactions between suppliers in Hong Kong and overseas customers. This was cited by 35% of suppliers interviewed in the country (38% at regional level). 33% of these latter (34% at regional level) said that foreign B2B customers pay invoices late due to liquidity issues. However, late payment from foreign customers is also often due to inefficiencies of the banking system (cited by 29% of the suppliers interviewed in the country, in line with the regional response rate), and to disputed invoices (mentioned by 27% of the suppliers interviewed in Hong Kong, versus 25% at regional level). Regardless of the reason for late payment, it appears to have an adverse impact on the ability of the businesses surveyed in Hong Kong to meet their payment obligations in a timely manner. 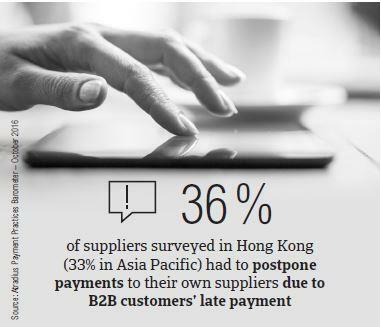 36% of suppliers surveyed in Hong Kong (33% in Asia Pacific) had to postpone payments to their suppliers, and around half of them were unable to pay their suppliers (19% in Asia Pacific). For 28% of suppliers surveyed in the country (34% in Asia Pacific), customers’ late payment meant taking specific measures to correct cash flow. To protect their businesses against the risk of payment default from B2B customers, half of the suppliers surveyed in Hong Kong (45% in Asia Pacific) will check their customers’ creditworthiness more over the next 12 months. The proportion of B2B receivables reported by suppliers surveyed in Hong Kong as being written off as uncollectable (just over 2.5% of the total value of B2B receivables, 2.3% last year) is almost in line with the average for Asia Pacific (2.1%). 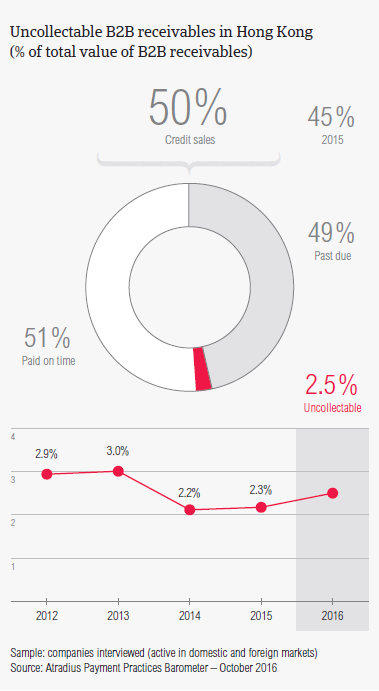 Domestic uncollectable receivables were written off more often than foreign ones. This tallies with the concerns about the collection of outstanding invoices in the home market expressed by suppliers surveyed in Hong Kong and commented on earlier in this report. Uncollectable domestic B2B receivables originated most often from the consumer durables and electronics industries. In line with the regional response rate, half of the suppliers surveyed in Hong Kong wrote off receivables as uncollectable because the customer went bankrupt or out of business. Around 30% of suppliers surveyed wrote off receivables as uncollectable due to a number of reasons, such as the failure of the collection attempts, inability to locate the customers or the age of the debt (too old to be collected). Suppliers surveyed in Hong Kong reported trading on credit terms mainly with B2B customers in the consumer durables, construction, ICT, logistics, food and services industries. Invoice payment terms extended to B2B customers in both the construction and logistics industries are notably more relaxed (averaging 40 days from the invoice date) than those offered in the other industries with which suppliers surveyed in Hong Kong trade on credit. These latter do not differ significantly from the country and regional averages (around 30 days each). Despite being granted more relaxed payment terms to settle their invoices, B2B customers in the construction industry take the longest to pay overdue receivables (on average 50 days from invoicing). The construction industry also generated the largest proportion of past due B2B invoices. Around 60% of the total value of B2B invoices issued by suppliers in Hong Kong ended up in late payment. This is the case for 50% and 40% of the total value of B2B invoices in the logistics and food and beverages industries respectively. Based on survey responses, late payment of invoices due to customers’ liquidity constraints occurred most often in the food and beverages industry (53% of suppliers surveyed in Hong Kong cited this). In the logistics industry, late payment was most often a consequence of disputed invoices (according to 44% of suppliers surveyed). In the ICT sector, an improvement in B2B customers’ payment behaviour is anticipated across most of the Asia Pacific region. Suppliers surveyed in Hong Kong (32%), in contrast, expect a deterioration in the payment behaviour in this industry over the next 12 months. In the food and beverages industry, two in five suppliers surveyed in Hong Kong expect no change in B2B customers’ payment practices, and nearly 30% expect deterioration. This is also the case for the payment behaviour of B2B customers in the logistics industry (45% of suppliers surveyed expressed this opinion). No significant change is anticipated in respect to payment practices of customers in other industries. What is the future of the Hong Kong dollar peg with the US dollar? US Fed rate hikes may not be enough to change the currency regime, but increasing integration with the Chinese economy may.